What follows is a Story of Ken Simmons from New Zealand, aged 85 and his pet cow “Silverside”, aged 38. Ken Simmons starts cycling around 8am with a homemade backpack lying limp upon his back. He pops in to a couple of properties on the way, collecting scraps of straw to fill his bag. About 30 minutes and three kilometers later, he stops and looks out across the fields. There she is. The 38-year-old cow has two twisted horns, pale-grey shoulders and a wrinkled neck, a leaking udder and milk running down her ankle. He named her Silverside, but he only ever calls her Girl. She was the first cow he bought when he retired. That was 15 years ago. After that, he gradually downscaled his small herd of cows till it numbered just one. And around her he has built a devoted routine; daily rituals that reveal an elderly man’s enjoyment in the simplest of tasks. This is the story of an extraordinary friendship between man and beast, both nearing the end of their long lives. He produces a small red apple and she sniffs it out, swallowing it with her furry lips and biting with her last remaining teeth. She has no front teeth. He has just one. He places straw in her trough, rinses out her bucket of molasses, and lets her out the gate. “C’mon, Bub.” She shuffles off ahead, as he talks about her diet. Every morning, he fills the bucket with two capfuls of trace minerals and a generous slurp of molasses. Her tail lifts and a stream of steaming brown liquid trails to the ground. “Perhaps a little too much molasses,” he says, wryly. Yes! This cow has crossed her 38th birthday and since last seven years hasn’t calved but still gives milk, probably out of her love for Mr Simmons. Jenny Weston, senior lecturer in cattle health at Massey University has never heard of a cow making it into its 30s. The average cow lives to seven years. A good milking cow might live to 13 before being culled for failing to get in calf. The oldest recorded cow, according to a cow factoid website, was Big Bertha. She died in 1993, aged 48, having produced 39 calves. Dr Weston says that a largely toothless cow like Girl would not survive without Mr Simmons. She would starve without hand-feeding as her gums could not rip enough grass. Dr Weston says cows are sociable and, in the absence of other cows, Mr Simmons’s companionship is undoubtedly keeping Girl alive. Mr Simmons says she is a good pal, who has never kicked him or used her considerable 350-kilogram bulk to nudge him out of the way. Occasionally, accidentally, she’ll stand on his foot, but she would never willingly hurt him. 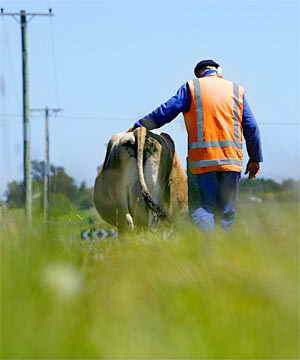 He wears blue overalls, a woolly jersey, gumboots and a reflector jacket that a friend’s wife bought for him. At the roadside, he leans over to hand-feed her little nuts of meal. He suspects the pampering may be the secret to her longevity. Girl enjoys her walk, grazing on the roadside grass. He watches her every move, taking delight in the changes in her mood. “Oh look, she’s puckering her lips.” When they get tired, they stop and collapse into the grass. He walks her to her field, and sidles up for a cuddle. “Come to Dad.” He gives her a hug, slaps her rump and tells her he’ll be back tomorrow. He packs away her feed, secures his backpack on his back, climbs on his bike and turns to cycle home . . . . back to his pensioner flat and the documentary channel. He spends about five hours a day with his Girl, the rest of it feeding his mind and soul. Mr Simmons was born in Hamilton in 1922, one of four children. His father was a motor engineer. He worked in a dairy factory in Waharoa, in the Waikato, before leaving for World War II. He was a radio operator with the New Zealand Division from 1943 to 1945. His wife separated long ago and his four children live around New Zealand but he doesn’t see much of them, his family, his life is his ‘Girl’. He pays $10 a week rent on the quarter- acre where Girl sleeps. She is tested for tuberculosis every year. He has bought her a thermal cover for winter and she has all the best supplements on the bovine market. Mr Simmons looks back on 85 years of memories and says life goes by very quickly. “You blink your bloody eyes and it’s gone.” His advice is to start praying that you’ll come back as a cow; the centre of the world for “some old fellow like me”. Why should you kill these innocent animals? You take. You keep them muda, happy, and you get so much milk that it will moist, it will make the ground wet. This is civilization. This is civilization.